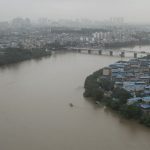 Our trip to Guilin started with a bit of a drama and at some point I thought we are not going to get there. Well.. at least not that evening as we planned. Everything kicked off when we decided to check-in at the Chendgu airport and we heard “Please follow me” from China Southern Airlines staff. It is that line that often rings the alarm bells. Since Marianna had her e-ticket printed off I stayed with our bags and she followed a small lady, who did not want to reveal any more information. The clock was racing and the time of our flight was approaching by the minute. When Marianna came back after fifteen or twenty minutes, which felt like ages to me, I found out that apparently our names are not listed anywhere in the system, which practically translated into a statement “you never bought the tickets” in the eyes of Chine Southern Airline. Just to complicate the situation even more, out of all different documents I had with me that e-ticket was not one of them so basically we were relaying on Marianna’s sheet of paper that acted as a proof that we were not telling lies and that indeed we bought the tickets. I actually remembered that I had similar problems with China Southern Airlines in Seoul but when I was in South Korea it was as simple as logging into my mailbox and showing them the confrontation number listed in an email – now I was in China… Forget about the internet access! The clock was ticking, more staff was gathering around us and for some reason I could not entirely believe what was actually happening. Marianna got nervous and I was somehow oblivious to the drama that was unfolding, revising different plan Bs in my head. After an hour and five Chinese people typing and pointing in front of the computer screen our names were found somewhere out there in the black hole of the airline system and we learnt that our flight was cancelled but no one notified us about it. Thanks China Southern Airlines! Nice touch! Luckily they rebooked our tickets and we could board China Air flight that was departing later but I promised not to fly with those jokers ever again. 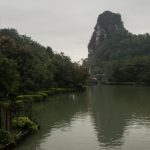 Once in Guilin I tried my best to find our way to the hostel as it was dark, drizzly and Marianna got a massive migraine paying the price of saving us an extra night in Chengdu and other an necessary expenses. 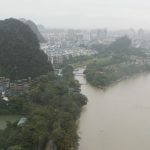 We were very unlucky with the weather in Guilin. 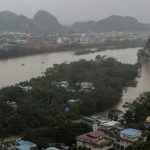 Although we enjoyed the view of the limestone mountains and the buildings scattered around them it was raining cats and dogs. The fact that everyone wanted to charge us for everything also dampen our mood. “How much for hiking up that hill? Seriously? It is not like someone is going to give me a piggyback ride! I am going on my own two legs!” – the complainer in me was unleashed. 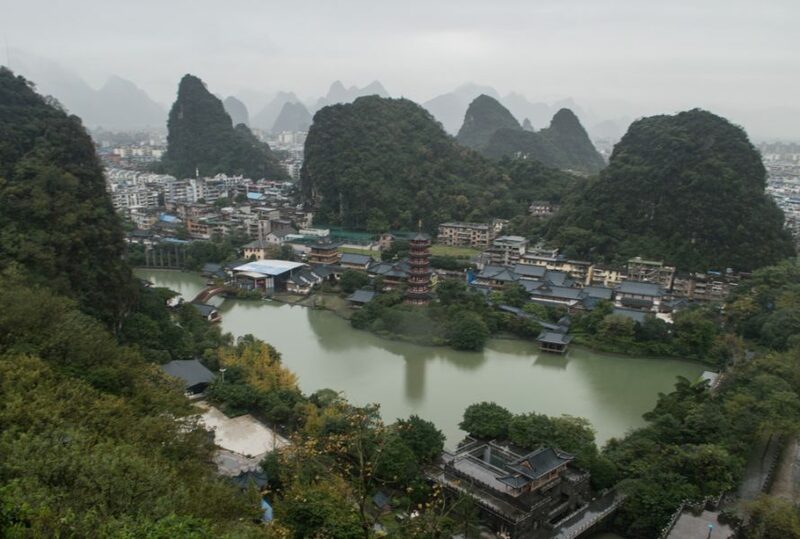 In the end we decided to visit Diecai Shan, the Folded Brocade Hill, one of Guilin’s most famous and popular parks. Going up the stone steps all the way to the top was not fun in the rain but the views were spectacular. At some point we took shelter in a massive cave that goes through the mountain but still we were soaked! 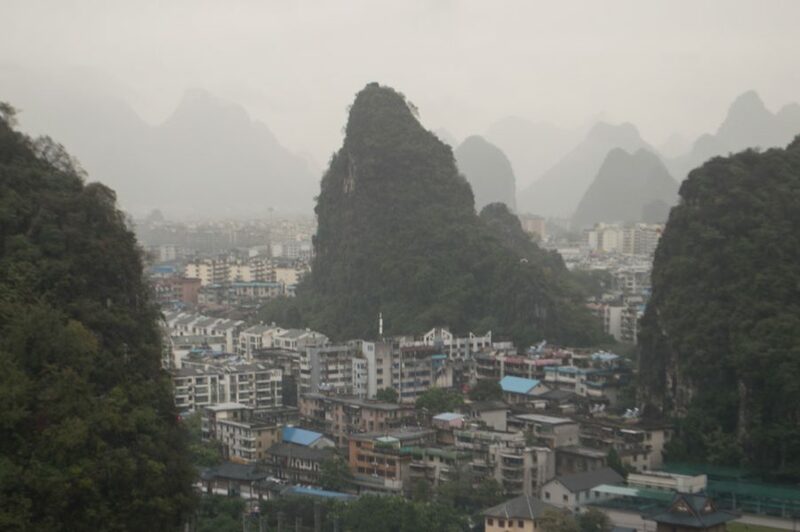 I would highly recommend Wada Hostel to anyone planning to visit Guilin. It is a little bit out of town but all in all everything else is making up for it. Wada girls were always greeting us with big smiles and helped with making dumplings when we joined the party to learn how to prepare them.